Before a year had passed, on October 29, 1916 Mamie’s widowed mother remarried. Mamie’s new step-father was Henry Thomas Cersey. The following summer Mamie herself was a bride. She married Joseph John “Joe” Spells on July 15, 1917 in Berrien County, Georgia. He was a son of Mary Matilda Browning and George Spells, a pioneer settler of Lowndes County, GA. The marriage was performed by Lyman Franklin Giddens, Justice of the Peace in Ray City. 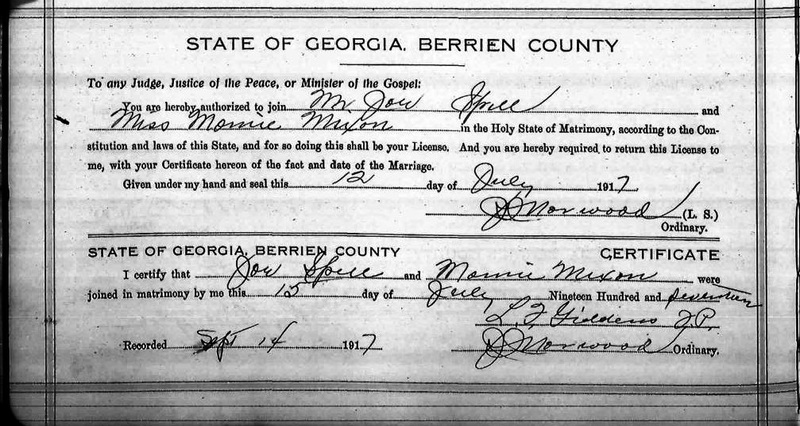 Marriage certificate of Mamie Mixon and Joe Spells. At 22, Joe Spells was tall with a medium build, blue eyes and light-colored hair. He was working for his brother, William, as a farmer. At the time, Joe Spells was illiterate, signing his WWI draft registration with his “X” mark. Joe Spells registered for selective service for World War I in 1917. He was drafted and served in WWI as did Mamie’s brother, Sammie E. Mixon. Sammie died of pneumonia while serving in France, but Joe survived the war and came home to Mamie. After the war, the Spells made their home on the farm of Mamie’s step-father, Henry T. Cersey, located in the 1157 Georgia Militia District on the Nashville and Valdosta Road. Joe worked as a laborer. Joseph W. Spells, born May 1, 1918; Ray City High School class of 1937; married Eloise McKay (Nov 5, 1914 – July 7, 1986); died in Winter Park, Florida July 7, 1986. A third child, a baby girl, was born and died in the summer of 1926. According to records, the child died on July 30, 1926, although the death certificate was not filed until August 4, 1926. 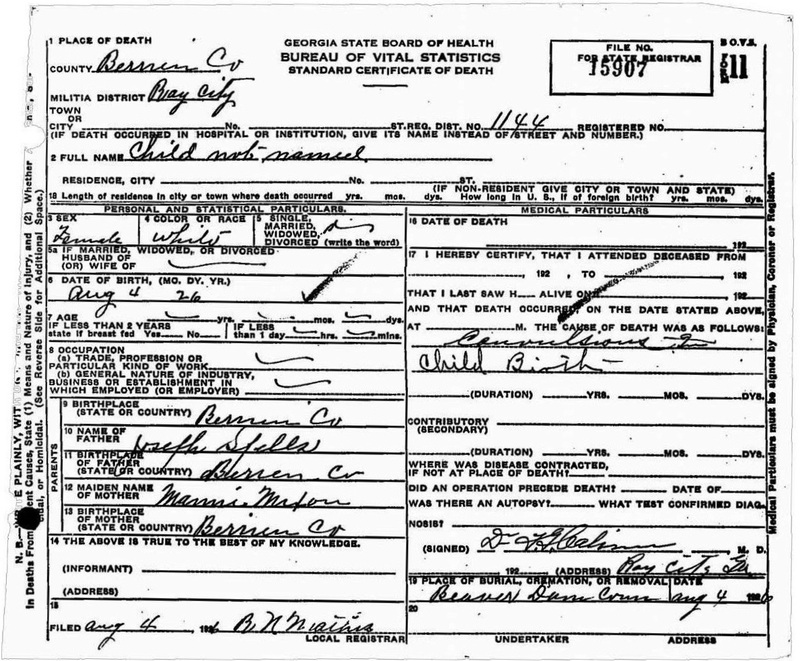 The death certificate attributed the cause of death to “convulsions in childbirth.” The infant girl was buried at Beaver Dam Cemetery, Ray City, GA.
Death Certificate for infant girl Spells, daughter of Mamie and Joe Spells, Ray City, GA..
Mamie Spells would survive her daughter by only one day. She was buried at Beaver Dam Cemetery, Ray City, GA. The funeral services for Mrs. Joe Spells who died at the home of her mother, Mrs. H. T. Cersey, Saturday, July 31, were conducted last Sunday morning at the Baptist church at Ray City at 11 o’clock in the presence of a large crowd of relatives and friends. Mrs. Spells was 36 years of age and was a member of the Ray City Baptist church and was a christian woman, a true wife, a loving daughter and mother. To know her was to love her. She had been in declining health for some time, but was in bed only about ten days. Her death was not unexpected to her love ones, but was a shock to her friends who knew not of her illness. She is survived by her husband and two small children, J. W. and Edward, 8 and 5 years old respectively; her mother and five sisters. They are Mrs. Lee Knox and Mrs. Lonnie Royals, of Ray City, GA.; Mrs. Joe Browning, of Lakeland, GA.; Mrs. Effie Chance, of Macon,GA., and Mrs. J.H. Kirk, of West Palm Beach, Fla.
We wish to take this method of thanking our many friends for the kindness shown us during the illness and death of our wife, daughter and sister, Mrs. Joe Spells. Mr. and Mrs. H. T. Cersey. The Census of 1930 shows the widower Joe Spells and his two sons living in the Rays Mill Precinct, Georgia Militia District 1144. Also living with them was Mamie’s widowed mother, Mary Mixon Cersey. Joe Spells later remarried. He died in 1961 and was also buried at Beaver Dam Cemetery, Ray City, GA.
LAKELAND- Joe Spell, 65, died at the local hospital early Sunday morning following a sudden attack suffered Saturday morning. He was born and had lived all his life in the Lower Tenth District section of Berrien County where he was a prominent farmer. Mr. Spell was a veteran of World War I and a member of the New Ramah Primitive Baptist Church at Ray City. Survivors include his wife, the former Matilda Richardson: two sons M Sgt J. W. Spell with the U. S. Air Force in Germany; Edward Samuel Spell of Atlanta; three sisters, Mrs. Henry Spires of Adel, Mrs. Cauley Downing of Florida and Mrs. Morris Daniels of Jacksonville, Fla.: one brother, John Spell of Valdosta: seven grandchildren and a number of nieces and nephews. Funeral services will be held Tuesday at 3 p. m. at New Ramah Church with burial in Beaver Dam Cemetery with Music Funeral Home of Lakeland in charge. The body will remain at the home of his brother-in-law, Pope Howell until the hour of the service.